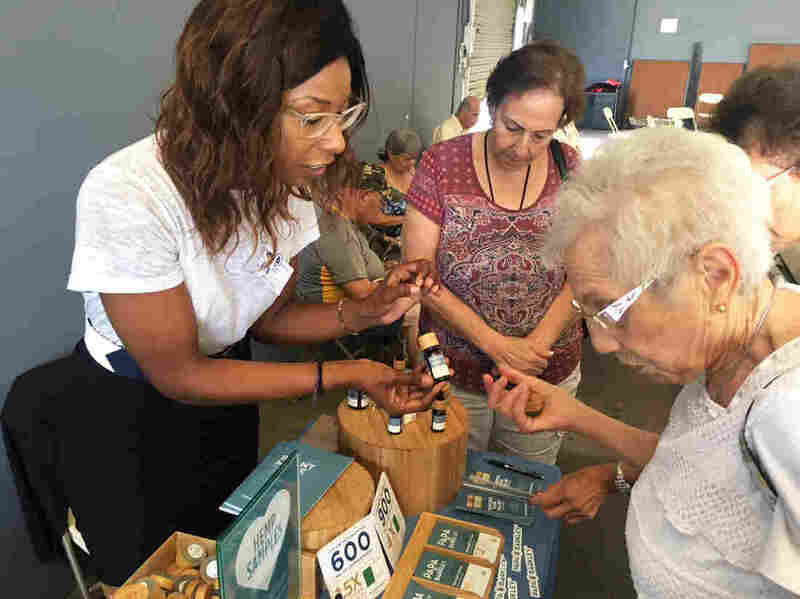 Seniors Flock to Marijuana Dispensaries To Relieve Aches And Pains : Shots - Health News Marijuana dispensaries are reaching out to seniors seeking help with the aches and pains of aging. They're discovering an array of products and some interesting side effects. 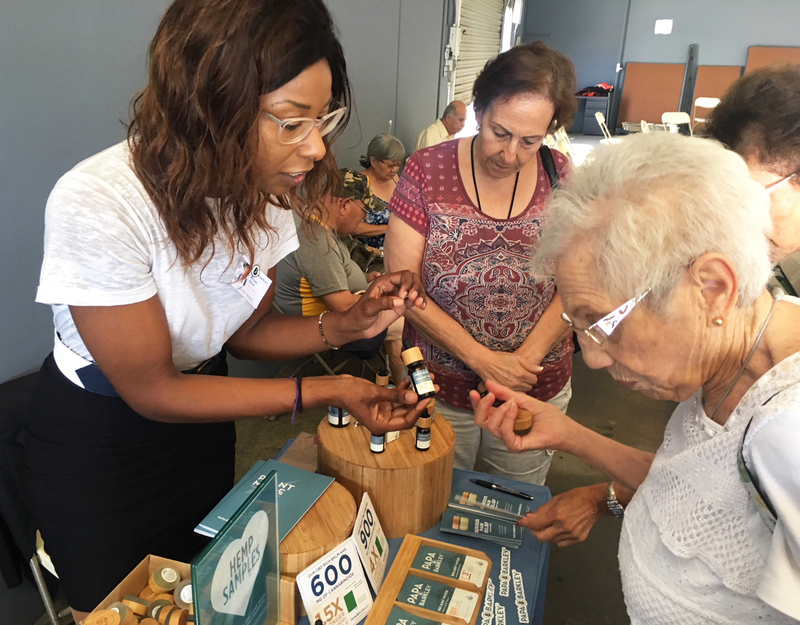 Megan Baker (left) of Papa & Barkley Co., a Cannabis company based in Eureka, Calif., shows Shirley Avedon of Laguna Woods different products intended to help with pain relief. Shirley Avedon, 90,­­ had never been a cannabis user. But carpal tunnel syndrome, which sends shooting pains into both of her hands, and an aversion to conventional steroid and surgical treatments are prompting her to consider some new options. "It's very painful; sometimes I can't even open my hand," Avedon says. So for the second time in two months, she has climbed aboard a bus that provides seniors at the Laguna Woods Village retirement community in Orange County, Calif., with a free shuttle to a nearby marijuana dispensary. The retired manager of an oncology office says she's seeking the same relief she saw cancer patients get from smoking marijuana 25 years ago. "At that time (marijuana) wasn't legal, so they used to get it off their children," she says with a laugh. "It was fantastic what it did for them." Avedon doesn't want to get high from anything she uses. So on her first trip, she picked up a topical cream that was sold as a pain reliever. It contained cannabidiol, or CBD, but was formulated without THC, or tetrahydrocannabinol, marijuana's psychoactive ingredient. "It helped a little," she says. "Now I'm going back for the second time hoping they have something better." ­­On this particular morning, about 35 seniors climb on board the free shuttle — paid for by a licensed cannabis dispensary in Santa Ana called Bud and Bloom. After about a half-hour drive, the large white bus pulls up to the parking lot of the dispensary. About half the seniors on board today are repeat customers; the other half are cannabis newbies who've never tried it before, says Kandice Hawes, director of community outreach for Bud and Bloom. "Not everybody is coming to be a customer," Hawes says. "A lot are just coming to be educated." Among them, Layla Sabet, 72, a first-timer seeking relief from back pain that she says keeps her awake at night. "I'm taking so much medication to sleep and still I can't sleep," she says. "So I'm trying it for the back pain and the sleep." Hawes invites the seniors into a large room with chairs and a table set up with free sandwiches and drinks. As they eat, she begins the presentation that focuses on the potential benefits of cannabis as a reliever of anxiety, insomnia and chronic pain and the various ways people can consume it. Several vendors on site also take turns speaking to the group about the goods they sell. Then, the seniors are invited into the dispensary where they're able to buy everything from old-school rolled joints and high-tech vaporizer pens to liquid sublingual tinctures, topical creams and an assortment of sweet, cannabis-infused edibles. He prefers to eat his cannabis. "I got chocolate and I got gummies," he tells a visitor. "Never had the chocolate before, but I've had the gummies and they worked pretty good." "Gummies" are cannabis-infused chewy candies. His contain both the CBD and THC, two active ingredients in marijuana. Derek Tauchman rings up sales at one of several Bud and Bloom registers in the dispensary. He says fear of getting high is the biggest concern expressed by senior consumers, who make up the bulk of the dispensary's new business. "What they don't realize is there's so many different ways to medicate now that you don't have to actually get high to relieve all your aches and pains," he says. Despite such enthusiasm, marijuana isn't well-researched, says Dr. David Reuben, Archstone professor of medicine and geriatrics at UCLA's David Geffen School of Medicine. While cannabis is legal both medically and recreationally in California, it remains a schedule 1 substance – meaning it's illegal under federal law. And that makes it harder to study. 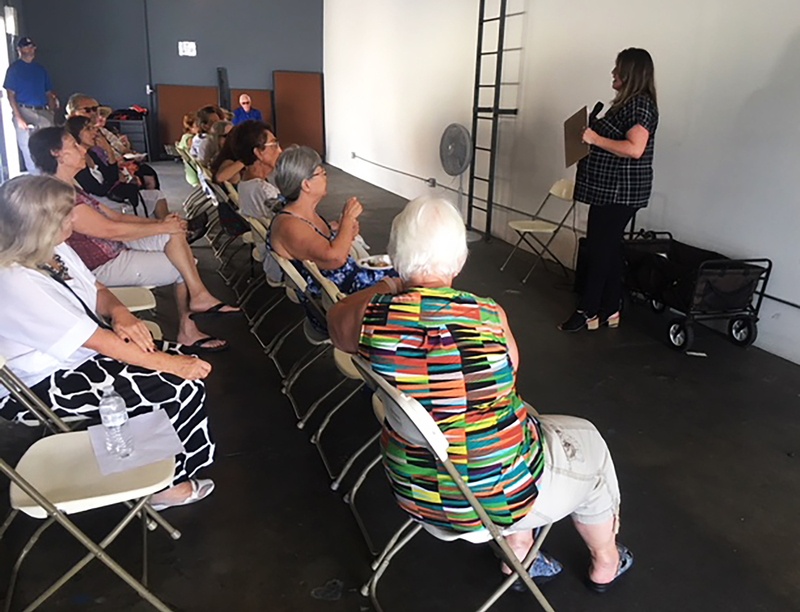 Kandice Hawes, director of Community Outreach for Bud and Bloom Cannabis store in Santa Ana, Calif., gives seniors an overview of medical marijuana. The limited research that exists suggests that marijuana may be helpful in treating pain and nausea, according to a research overview published last year by the National Academies of Science, Engineering, and Medicine. Less conclusive research points to it helping with sleep problems and anxiety. Reuben says he sees a growing number of patients interested in using it for things like anxiety, chronic pain and depression. "I am, in general, fairly supportive of this because these are conditions (for which) there aren't good alternatives," he says. But Reuben cautions his patients that products bought at marijuana dispensaries aren't FDA regulated, as are prescription drugs. That means dose and consistency can vary. "There's still so much left to learn about how to package, how to ensure quality and standards," he says. "So the question is how to make sure the people are getting high-quality product and then testing its effectiveness." And there are risks associated with cannabis use, too, says Dr. Elinore McCance-Katz, who directs the Substance Abuse and Mental Health Services Administration. "When you have an industry that does nothing but blanket our society with messages about the medicinal value of marijuana, people get the idea this is a safe substance to use. And that's not true," she says. Side effects can include increased heart rate, nausea and vomiting, and with long-term use, there's a potential for addiction, some studies say. Research suggests that between 9 and 30 percent of those who use marijuana may develop some degree of marijuana use disorder. Still, Reuben says, if it gets patients off more addictive and potentially dangerous prescription drugs — like opioids — all the better. "I have no way to measure, but I'd say it gets rid of 90 percent of the pain," says Levy, who — like other seniors here — pays for these products out-of-pocket as Medicare doesn't cover cannabis. "I got something they say is wonderful and I hope it works," says Avedon. "It's a cream." The price tag: $90. Avedon says that if it helps ease the carpal tunnel pain she suffers, it'll be worth it. "It's better than having surgery," she says. Though marijuana use remains illegal under federal law, it's legal in some form in 30 states and the District of Columbia. And a growing number of Americans are considering trying it for health reasons. For people who are, doctors advise the following cautions. Talk to your doctor. Tell your doctor you're thinking about trying medical marijuana. Although he or she may have some concerns, most doctors won't judge you for seeking out alternative treatments. Make sure your prescriber is aware of all the medications you take. Marijuana might have dangerous interactions with prescription medications, particularly medicines that can be sedating, says Dr. Benjamin Han, a geriatrician at New York University School of Medicine who studies marijuana use in the elderly. Watch out for dosing. Older adults metabolize drugs differently than young people. If your doctor gives you the go-ahead, try the lowest possible dose first to avoid feeling intoxicated. And be especially careful with edibles.They can have very concentrated doses that don't take effect right away. Elderly people are also more sensitive to side effects. If you start to feel unwell, talk to your doctor right away. "When you're older, you're more vulnerable to the side effects of everything," Han says. "I'm cautious about everything." Look for licensed providers. In some states like California, licensed dispensaries must test for contaminants. Be especially careful with marijuana bought illegally. "If you're just buying marijuana down the street ... you don't really know what's in that," says Dr. Joshua Briscoe, a palliative care doctor at Duke University School of Medicine who has studied the use of marijuana for pain and nausea in older patients. "Buyer beware." Bottom line: the research on medical marijuana is limited. There's even less we know about marijuana use in older people. Proceed with caution.